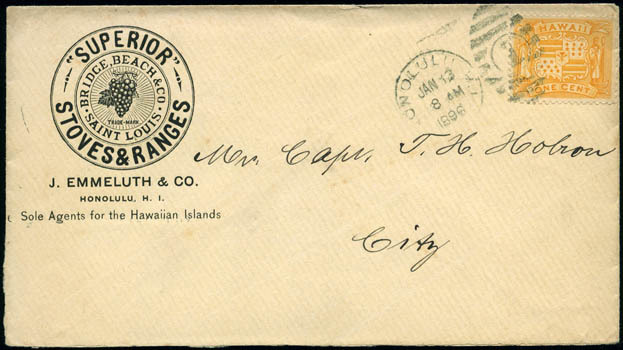 J. Emmeluth & Co., Honolulu, H.I., illustrated corner card as sole agents for Superior Stoves & Ranges showing grapes, on light buff cover addressed locally to T.H. Hobron bearing 1¢ yellow (74) tied by "Honolulu, H.I. Jan 13, 1896" duplex, Very Fine. Peters-Uota No. JEC-IL-1 Estimate $200 - 300. A link back to Sale 65 - Lot 324, along with its description, will be appended to your message.